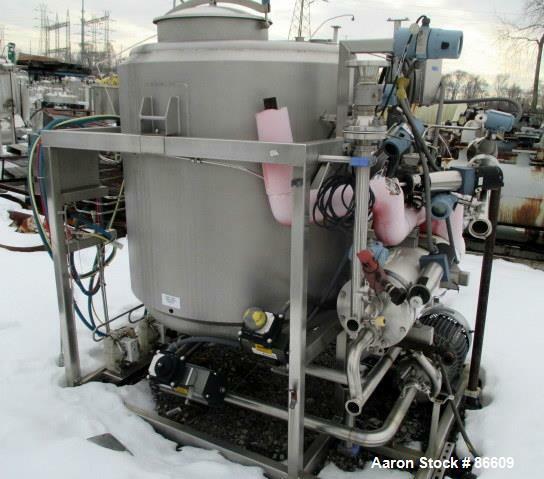 View Aaron Equipment’s inventory of unused and used clean in place (CIP) system. If you are looking to sell your used clean in place system submit a request online or contact Erik Eichert at 630-238-7480. 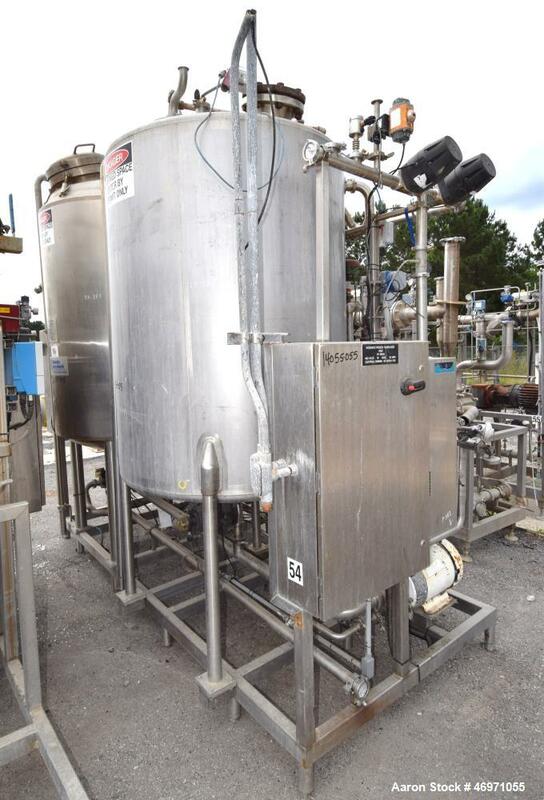 Used- Hartel Clean In Place CIP System, 316 Stainless Steel, Model HC16369. Used- Passivation Skid. 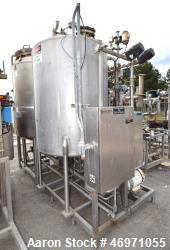 Consisting of: 100 Gallon tote tank, Stainless steel with 100,000 BTUH electric heater. Hydac contamination monitors, cartridge filters, pumps: flow rate: 120 gpm, head: 150 psi (345 Ft. W.G.). Motor: 20 hpP, VFD, drain pump: 25 gpm at 25 feet TDH. Power panel: single power connection, 460V, 3Ph, 60 Hz. Manifold: (6) - 1" and (2)- 1/2" connection. 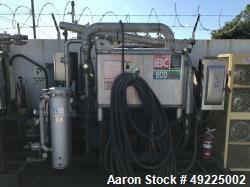 Last used for hydraulic system testing and cleaning. Used- Passivation Skid. Consisting of: 100 Gallon tote tank, Stainless steel with 100,000 BTUH electric heater. Hydac contamination monitors, cartridge filters, pumps: flow rate: 120 gpm, head: 150 psi (345 Ft. W.G.). Motor: 20 hpP, VFD, drain pump: 25 gpm at 25 feet TDH. Power panel: single power connection, 460V, 3Ph, 60 Hz. Manifold: (6) - 1" and (2) - 1/2" connection. Last used for hydraulic system testing and cleaning. 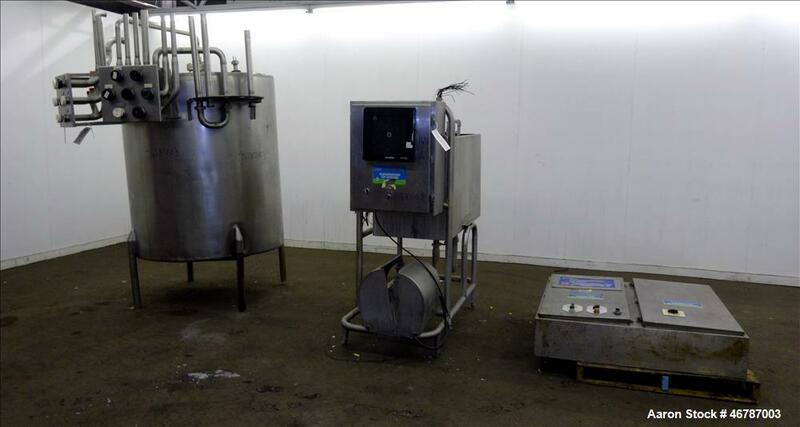 Used- Hartel Clean In Place CIP System, Model HC16369, 316 Stainless Steel. Consisting of: (2) 85 Gallon tanks approximate 24" diameter x 44" straight side, (2) 94 gallon tanks approximate 24" diameter x 48" straight side, (1) TCI Superior centrifugal pump, Model SCS-65, driven by a 5 hp motor, (2) Pulsafeeder Pulsa 680 diaphragm metering pumps, Model 680C-S-E, maximum flow 19.4 gallons per hour and 9102859-2, each driven by a 0.17 hp motor, (1) Allen-Bradley Model FC15/A flat panel monitor. 2" Inlet/outlets. Mounted on a stainless steel frame. Includes miscellaneous piping and valves. 3/60/460 volt, 100 amp. Heat Exchanger not included. 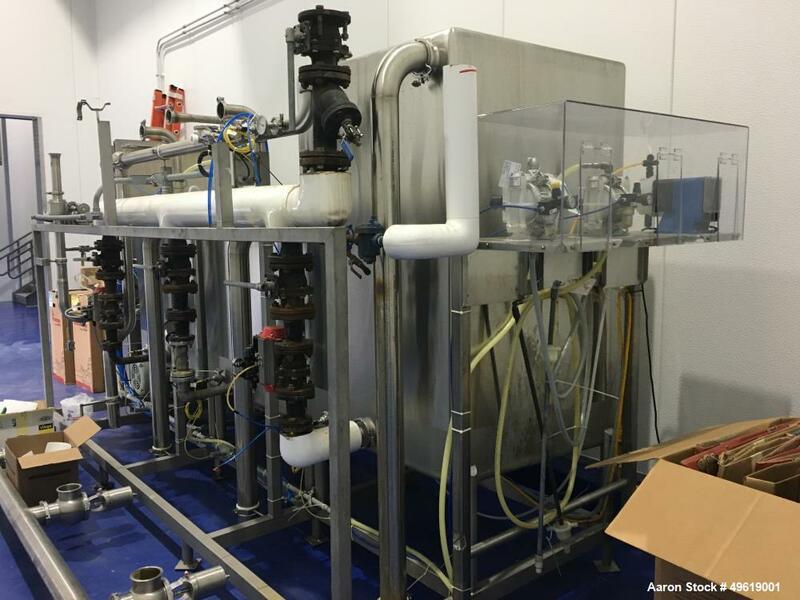 Used- Sanimatic CIP System. Consists of 3 Square Stainless steel Tanks. Tanks 1 and 2 are 42" wide x 42" long x 46" high, flat top, pitch bottom, 12 Ga., non-insulated, Non-ASME atmospheric, 18" hinged and gasketed manway, anti-vortex breaker, ID color cleaned, OD top/side walls ground and bottom glass bead blast, #4 finish ID/OD, Fabricated per 3A. Tank 3 is 42" wide x 42" long x 68.5" high, flat top, pitch bottom, 12 Ga., non-insulated, Non-ASME atmospheric, 18" hinged and non-gasketed manway, anti-vortex breaker, ID color cleaned, OD top/side walls ground and bottom glass bead blast, #4 finish ID/OD, Fabricated per 3A. Includes: Associated piping, valves, check valves, pumps and main control panel. Yr. 2010. Used- Martin Petersen Company CIP Skid with 300 gallon stainless steel tank, insulated, top openings 18" manway, (2) 3" and (2) 1-1/2". 3" Center bottom outlet. Includes (1) Enerquip shell and tube heat exchanger, shell and tube rated 150 psi at 375 degrees F, serial# 4573. (1) Waukesha/Cherry Burrell pump, model 2065, stainless steel, 2" inlet/outlet. (2) Basket filters with 15hp, 3/60/230/460 volt circulation pump. Mounted on common base. Serial# M00077. Built 2000. Used- Klenzade CIP System, Model Klenzmation. Consists of: (1) MP1800 Turbo Controller, (1) Perma-San 500 Gallon Tank, 316 Stainless Steel, Flat Top, sloped bottom. Approximate 52" diameter x 59" straight side, top openings 18" man way with cover, 3" for spray ball, (2) 2-1/2", (2) 2", (2) 2". 2" Side bottom outlet. 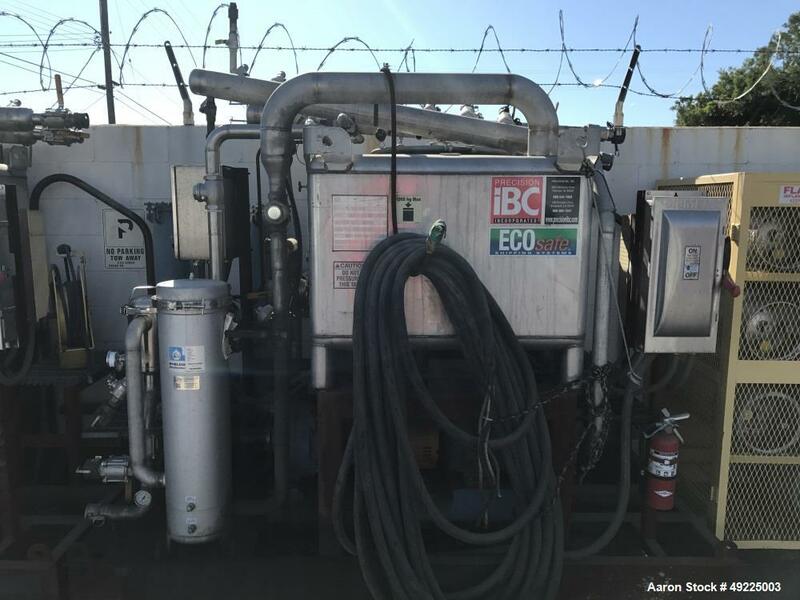 (2) transfer stations, (1) spray ball, (1) Balance Tank, approximate 48" long x 24" wide x 30" deep with dimple heating section, (1) Ampco centrifugal pump, model 2.5x2 ZC2, Serial# V-55162-1-1. 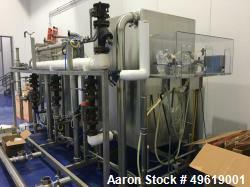 Used- Hartel Clean In Place CIP System. Consisting of: (1) Waukesha Cherry-Burrell pressure tank, 396 gallon, 316L stainless steel. Internal rated 30 psi at -20 to 350 degrees F., National Board # 4417, Serial # E-342-95, built 1996. (1) approximate 500 gallon 304 stainless steel tank, (1) Allegheny Bradford shell & tube heat exchanger, shell and tubes rated 150 psi at -20 to 300 degrees F., Serial # 024395-1-1-1, built 2008, (1) Waukesha Cherry-Burrell centrifugal pump, Model 2065LV, stainless steel, Serial # 270232-00. Driven by a 10 hp, 3/60/208-230/460 volt, 3450 rpm motor, (2) stainless steel control cabinets with an Allen-Bradley PowerFlex 70 drive only, and Allen-Bradley Flex I/O controllers. Mounted on a stainless steel frame.